It's a rough life for the Tsimane, an isolated indigenous group in Bolivia. They make a living by hunting and foraging in forests, fishing in streams and clearing land by hand to grow crops. Their rugged lifestyle might imply that Tsimane men have elevated testosterone to maintain the physical activity required to survive each day. But new research shows that Tsimane ("chi-MAH-nay") men have a third less baseline testosterone compared with men living in the United States, where life is less physically demanding. And unlike men in the U.S., the Bolivian foragers-farmers do not show declines in testosterone with age. "Maintaining high levels of testosterone compromises the immune system, so it makes sense to keep it low in environments where parasites and pathogens are rampant, as they are where the Tsimane live," said Ben Trumble, an anthropology graduate student at the University of Washington. That men living in the U.S. have greater circulating levels of testosterone represents an "evolutionarily novel spike," Trumble said. The spike reflects how low levels of pathogens and parasites in the U.S. and other industrialized countries allow men to maintain higher testosterone without risking infection. Trumble is lead author of a paper published online March 28 in Proceedings of the Royal Society B.
Trumble also pointed out that whereas men in the U.S. show a decline in testosterone as they age, and testosterone drops serve as a sentinel for age-related disease, Tsimane men maintain a stable amount of testosterone across their lifespans and show little incidence of obesity, heart disease and other illnesses linked with older age. Despite lower circulating levels of testosterone under normal conditions, the forager-farmers do have something in common with U.S. men: short-term spikes of testosterone during competition. 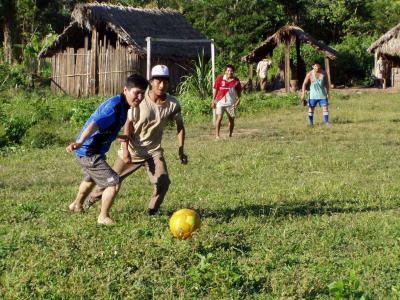 Trumble and his co-authors organized a soccer tournament for eight Tsimane teams. The researchers found that Tsimane men had a 30 percent increase in testosterone immediately after a soccer game. An hour after the game, testosterone was still 15 percent higher than under normal conditions. Similar percent increases have been shown in men living in the U.S. or other industrialized nations following sports competitions. The study suggests that competition-linked bursts of testosterone are a fundamental aspect of human biology that persists even if it increases risk for sickness or infection. As for whether higher levels of the male hormone would offer a competitive advantage in sports, Trumble suspects that because U.S. men "are taller, and weigh more than Tsimane men, and tend to be exposed to fewer parasites and pathogens, they would probably have a competitive advantage regardless of circulating testosterone." "What's interesting is that in spite of being in a more pathogenic environment, it's still important to raise testosterone for short-term bursts of energy and competition," said Michael Gurven, co-author and anthropology professor at the University of California Santa Barbara. The lives of the Tsimane offer a glimpse of how our species survived before industrialization and modern amenities. "Our lifestyle now is an anomaly, a major departure from our species' long-term existence as hunter-gatherers," said Gurven, who co-directs the Tsimane Health and Life History Project with Hillard Kaplan, co-author and an anthropology professor at the University of New Mexico. The work was funded by the National Institute of Child Health & Development and the National Institute on Aging and conducted in the UW Biological Anthropology and Biodemography Lab. Other co-authors are Kathleen O'Connor and Eric Smith, both professors in UW's anthropology department and UW's Center for Studies in Demography and Ecology; Daniel Cummings, University of New Mexico; and Christopher von Rueden, University of California Santa Barbara.